← >NCAA Re-thinking Tournament Seeding? > After a five day drive from Manchester, New Hampshire to Ontario, California, Jeff Zatkoff is just ready to play some hockey. 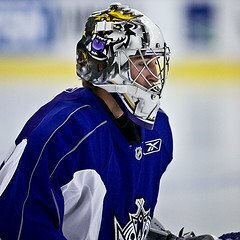 The San Bernadino Sun has a quick article about Zatkoff’s cross country quest and future with the Ontario Reign this season…a season in which he’s slated to be “the man” between the pipes for the first year ECHL franchise. You can see the article at this link. Thanks to laxmom for the heads up…again. Posted on October 14, 2008, in Jeff Zatkoff, Miami Alumni. Bookmark the permalink. Leave a comment.